Every day, the iWave team works closely with development professionals from nonprofits of every size and scope. Some are longtime clients, others are looking at prospect research tools for the first time, and still, others are looking to switch from different software and start using iWave. In all these conversations we hear a number of frequently asked questions, including myths and misconceptions about iWave. To help answer your questions, here are the facts! FAQ 1: I really don’t get the whole credits thing. What are iWave Credits anyway? iWave Credits are refreshed upon renewal of your subscription – so if you start with 5000 in June 2018, you will receive an additional 5000 in June 2019. Keep in mind, your credits don’t roll over. 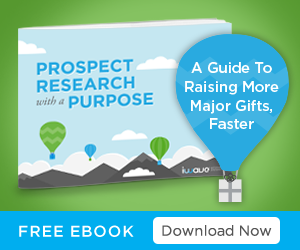 The idea is to use them now so you can meet your fundraising goals as soon as possible. If you are wondering how to get started and get the best use out of your credits, reach out to your Account Executive or contact iWave Support. You can also learn more about iWave Credits here. FAQ 2: I heard iWave is a Canadian company. Do you only have Canadian data? We’re a proudly Canadian company, but we serve clients all over the world – including the United States, the United Kingdom, Australia and Oceania, and more. To deliver value to all these different organizations, we offer diverse data from a range of multinational sources. Several of our datasets include international data, such as Thomson Reuters, RelSci, Dun & Bradstreet, and DatabaseUSA. Check out more about iWave’s datasets here. FAQ 3: Why do you recommend I adjust my iWave Screening preferences? 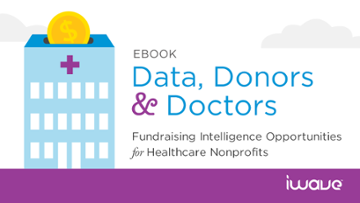 Each organization has different fundraising goals. Even within your organization, your goals could change from user to user, campaign to campaign, or project to project. This is especially true for screening. If you’ve used other screening tools, your ability to customize might have been limited. iWave Screening is all about customization. 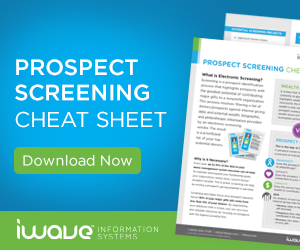 If you don’t personalize your settings to suit your needs and goals, you might end up with a skewed iWave Score, higher number of false positives, or simply bad prospects. 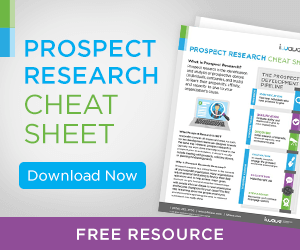 Always remember to adjust the default preferences so they match the needs of your organization. It’s super easy! Remember that your account preferences aren’t shared with other users on the account so ensure that every user adjusts their preferences accordingly. If you’re not sure how to do this or need help determining your goals, reach out! FAQ 4: I heard iWave has a limit of 2 users. Is that true? No way! You can have as many users as you want. Our subscriptions work on a concurrent user model. If you want to add a user to your account, reach out to your account executive or iWave Support. FAQ 5: I’m looking for giving data. Do you have that? Yes, we do! Our VeriGift charitable giving data is second to none. With over 150 million records, VeriGift is iWave’s own database of US and Canadian charitable gift donations, donors, and recipients. This is one of the first datasets I show to people who are interested in iWave – knowing a prospect’s past giving is a great indicator of future giving. And each VeriGift record is traced back to the original source, like an annual report or Form 990. You won’t get the same data or ease of use from anywhere else. But it goes beyond giving data. iWave has political giving records sourced from the US Federal Elections Commission and Elections Canada. If you’re interested in researching foundations for grant purposes, we have really great data from Guidestar and the Canada Revenue Agency. BONUS: I only care about wealth data. Why should I even bother with iWave? Well, are you prepared for inflated capacity ratings? That’s the danger when you only look at wealth. We have some really great real estate and wealth datasets like Thomson Reuters (including Insider Filings) and Prospects of Wealth (for HNWI individuals). 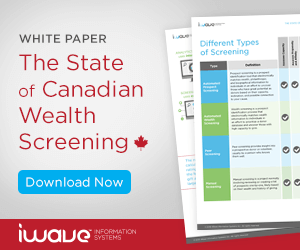 You can easily adjust your screening and scoring settings to narrow your focus on wealthy individuals only. But iWave’s data also includes insight on propensity (likelihood to give) and affinity (connection your cause). 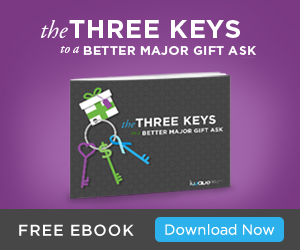 It’s all about getting the best context for a major gift ask. Are wealth indicators going to get all that information for you all the time? Our clients tell us No, and that’s why we give you the option to choose what you want to research at any given time. I’ll push the question back to you: Why limit yourself by focusing only on wealth? There’s a lot more to know. If you have more questions about iWave’s features, data, or other services from iWave, let us know here.